Our most recent exhibition, The Paper Age, opened up our rich collection of Georgian Prints for display. Running from the 26th June – 3rd July, The Paper Age explored how the print became a means of refinement, entertainment and news, both reflecting and influencing the culture of an age. True to the period, we displayed wonderful satirical prints and a vast array of topographical, architectural and botanical engravings that would have been as eagerly collected by Georgian society as they are today. These pieces were selected for the part they played in the cultural enlightenment of society. The Enlightenment was to change Georgian Society enormously, having swept through Western Europe from the early 17th century. It encouraged learning that allowed prints to be enjoyed beyond their aesthetic alone. Prints such as the stunning botanical engraving by Dr. Robert Thornton of a Queen Flower (fig.I), were produced to reveal the latest botanical discoveries, and to glory in the unbridled and sumptuous aesthetic of the highest quality engravings of the time. Although often considered rather more ephemeral pieces at the time, satirical prints are considered some of the most revealing examples of Georgian printmaking, critically reflecting society and famed for their unrestrained wit and enduring popularity. S.W. Fores was a publisher perhaps best known for his collaboration with some of the greatest satirists of the period such as Charles Williams and George and Isaac Cruikshank. His business was in the heart of the West End, at No. 3 Piccadilly. Fores was the first to hire out folios of caricatures for an evening’s entertainment. These satirical engravings, (figs.II-IV), are examples of such satires that were greedily consumed in both the public and private sphere. From the Napoleonic satires like the Little Princess and Gulliver, to prints such as the Illustrious Lover – which mocks the son of George III , the Duke of Cumberland, for his infatuation with his lover – satires were both objects of entertainment and social criticism alike. The great William Hogarth was also noted for his satirical works, often using his talents to raise awareness for social concerns, such as the Gin Craze; the ramifications of which are shown in Hogarth’s great duo, Gin Lane and Beer Street. Alongside this seminal duo, we have other wonderful series such as the celebrated moral progress of Marriage à-la-Mode – a set of six engravings that chart the disastrous marriage between a Viscount plagued with venereal disease and his adulterous new bride. Such satires were enjoyed for both their humour and the multi-faceted moral narrative journey. The streets of London were developing just as rapidly as society’s appetite for these engravings. The population of London was to swell from 630,000 in 1715, to 1.4 million in 1815, enveloping many small villages such as Hampstead and Chelsea. Areas of Bloomsbury were developed within the Duke of Bedford’s estate, evolving from the slums and farmland of St. Giles’s into areas frequented by the wealthy. Looking to Europe for architectural inspiration, such developments embraced the classical style and London moved away from its cramped medieval streets. Such was George III’s love of architecture that his daughters were to exclaim that he loved the subject more than he loved them. The King was certainly an enlightened individual, and was considered the most cultured Monarch, having controversially been tutored by John Stuart, the 3rd Earl of Bute – who was later to become Prime Minister. By the mid eighteenth-century, a range of neo-classical modes were fashionable and were implemented for the building of many new grand squares and streets. The Venetian Andrea Palladio was revered by the great architects of the day, such as John Nash, who embraced a style later to be known as “Palladian”. 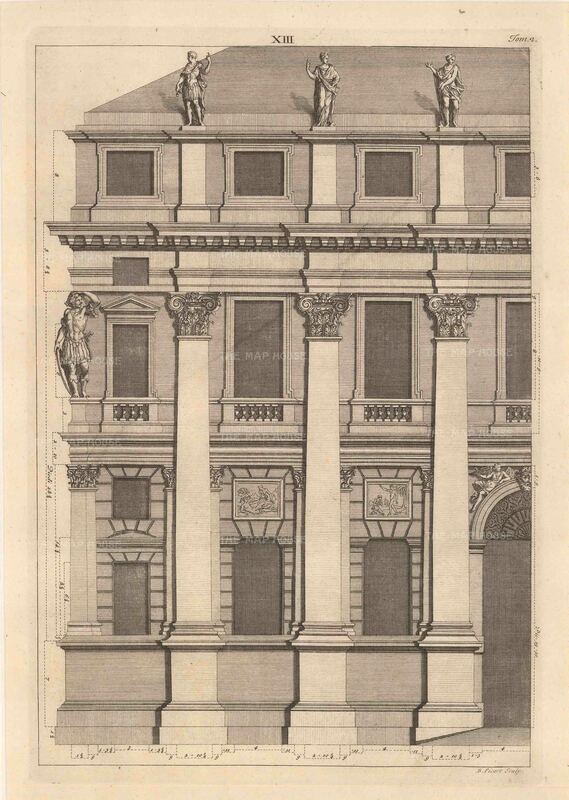 These engravings (figs.V-VI) were features in Palladio’s treatise on architecture, which was republished in 1715 by Giacomo Leoni in London. They featured the engaged Corinthian columns and elegant balustrades that were soon to be embraced by the residents of London. It was perhaps the developing enthusiasm for the Grand Tour among the upper classes, which led classicism to be embraced so wholly in London. The culmination of this diverse collection can be seen to capture what is very much the spirit of the Georgian Age, embracing their enthusiasm for discovery, knowledge, amusement and beauty. If you would like any further information about any of the works featured in this collection, then do not hesitate to get in touch.